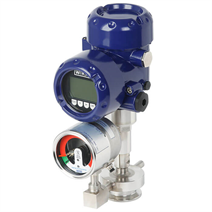 The WIKA combinations consisting of diaphragm seal, pressure measuring instrument and monitoring element are best suited for the harshest and hygienic measuring tasks. The systems can withstand the cleaning vapour temperatures occurring in SIP processes and ensure a sterile connection between the medium to be measured and the diaphragm seal. The patented diaphragm monitoring has been designed specifically for the highest safety requirements in the pharmaceutical and biotechnology industries. The monitoring element is mainly used for electrical signal transmission of the diaphragm condition. In addition, the diaphragm condition is displayed on a dial with red/green areas. In the event of a diaphragm rupture, a second, internal diaphragm in the pressure measuring instrument ensures the reliable separation of the environment and the process. Mounting of the diaphragm seal to the measuring instrument is made as direct mounting as standard. A fluid inside the system, which is explicitly chosen to suit the particular application, hydraulically transmits the pressure to the pressure measuring instrument. Diaphragm seals with clamp connection have been specifically developed for use in sterile processes and are integrated into the process by means of a clamp. This ensures the hygienic process integration of the diaphragm monitoring system. The product WIKA model DMS-FP is protected under granted patent DE 19949831 and is subject to several pending patents, so e.g. US 2018180505, DE 102016015447, CN 108240885.